A tour for people interested in learning more about ADUs and meeting the homeowners, builders, and designers who built them. Friday, November 6th. 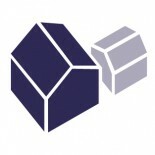 The one-day small housing summit will gather leaders in the small house movement to share what’s working and what’s next. Learn about cottage clusters, elegant space efficient designs, and smart policy initiatives that build community. 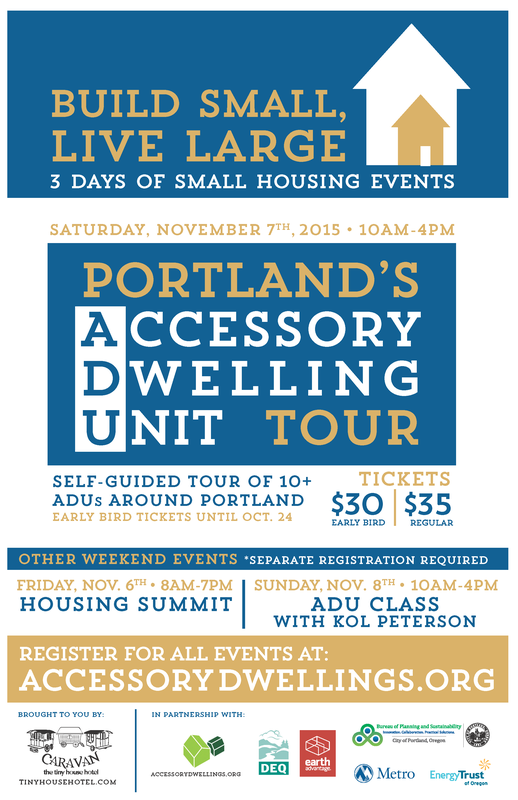 Saturday, November 7th, 10am-4pm- ADU Tour: Attendees take a self-guided tour of ~10 ADUs in Portland at their own pace. This fall tour will contain a new set of ADUs throughout Portland, never featured on the ADU Tour before. More information about the ADUs on this year’s tour will be posted by October, 2015. October 18th update: Guided tour option: The first guided tour sold out very quickly, so we opened up a 2nd guided tour group. It will likely sell out quickly as well. This guided tour will provide contextual insights into ADU design considerations, regulations, and costs. This guided tour option will cost $95 and will be capped at 14 people. This exclusive, guided tour will go from 9:30am-4pm. This tour will be done in a 15 passenger van. You will gather at Caravan- The Tiny House Hotel at 9:30am on Saturday, November 7th. We’ll email you with information about more logistics prior to the tour. The tour guided for Group 2 is Lina Menard, author of the ADU case studies featured on AccessoryDwellings.org and owner of Niche Consulting. This class is intended for homeowners interested in building an ADU on a property in Portland who attended the City wide ADU Tour on November 7th. In the class, we will reference numerous ADUs that are featured on the tour in the discussions about the zoning regulations and small space design. The class is an on-ramp to the process of designing and building an ADU. This class will cover what you’ll execute and manage in the course of designing and building and ADU. It is intended to make the whole process and project better by helping you understand the ADU design, management, and building process. By the end of the class, you will better understand the design/permit/build process, which will save you significant time and money, and will result in a better product–an ADU that will work well for your particular situation. The information covered in the class is targeted to Portland, as regulations vary by city. Roughly 50% of the information is relevant to those who wish to build an ADU or small house outside of Portland, Oregon. The class is offered every 4-6 weeks, so if you can’t attend this special edition class, you can always sign up for a different class date. 5009 NE 11th Ave, Portland, OR, 97211. Build Small Live Large housing summit attendees can pick up tickets at the summit on Friday, November 6th, 2015.